Continuing our visit to Griffith Observatory in Los Angeles, these two pictures show the towers of two main telescopes at the Observatory. 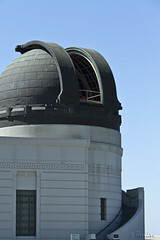 Mounted in the copper-clad domes on either end of the building, the Zeiss and solar telescopes are free to the public every day and night that the sky is clear. In the 1880s, Griffith J. Griffith donated the land that eventually became Griffith Park. At some point, he had an opportunity to look into space through what was then the largest operating telescope, at the Mount Wilson Observatory. He was so moved by the experience that he left money in his will to build an observatory, exhibit hall, and planetarium that would be available, for free, to the public. 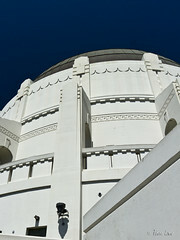 The Observatory was opened to the public in May, 1935.